Particularly demanded, BTX chemicals – benzene, toluene and xylene – are the building blocks for a wide range of products of our everyday life, such as plastics, fuels, medicines and paints. These chemicals are now based on fossil raw materials like oil, contributing to CO2 emissions, oil depletion and local environmental issues. Demand is rapidly growing for chemicals generated from renewable sources, creating a need for alternative, environmentally friendly production routes. 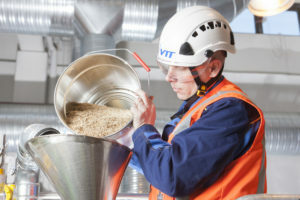 EARTO Member VTT has developed a new highly selective and competitive process for the manufacture of green BTX chemicals from lignocellulosic biomass such as wood, from wastes or even from captured CO2, able to replace oil-based BTX. The process will alleviate the dependency on fossil raw materials in the chemical industry, while facilitating the efficient conversion of domestic biomass to valuable products and energy. This process is also flexible enough to be integrated into other industrial processes, like energy production or biorefineries. Pure aromatic hydrocarbons, such as BTX, are one of the most sought-after chemicals, with a total worldwide volume of 95 MT currently worth 55 billion €. In the long run, the future of oil-based chemicals is threatened due to problems of oil availability, rising and highly volatile oil prices and environmental concerns. In the short run, the consumer pull is already there for green and sustainable materials. 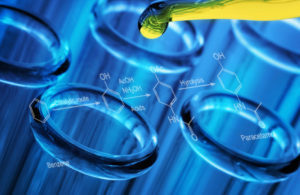 Chemical and pharmaceutical companies are actively looking for green solvents and renewable raw materials. Many companies are developing bio-BTX processes from biomass, but so far, no commercial processes or products are available. The process developed at VTT for manufacturing bio-BTX offers a feasible route all the way from biomass to a wide array of green chemicals. Diverse non-food raw materials are transformed through a unique combination of different steps such as biomass gasification. The products are chemically identical to current BTX and can thus replace them directly and be mixed with them in any proportion. This very flexible process offers the most feasible opportunity to industrially viable, scalable and robust bio-BTX manufacturing. The benefits over other bio-BTX processes are product purity, high total yield from biomass to products, flexibility in raw material intake and products selection, and robustness. By providing an alternative route to imported fossil raw materials, the process improves security of supply within Europe. VTT has been doing larger-scale development work in its Bioruukki piloting centre to demonstrate the industrial viability of the entire process. The technology has an estimated manufacturing price in the range of long-term average BTX market price. The bio-based BTX product has been further demonstrated in higher-value applications like paracetamol production. Within 5 years, the concept should be validated and the primary commercialisation route will be carried out by a VTT spin-off through technology maturation, licensing, piloting, and developing the next products. VTT Technical Research Centre of Finland Ltd is among the major research and technology organisations in Europe. Our research and innovation services give our partners, both private and public, all over the world a competitive edge. We pave the way for the future by developing new smart technologies, profitable solutions and innovation services. We create technology for business – for the benefit of society.